Businesses of all sizes are migrating to IP telephony in order to take full advantage of unified communications. Cisco Unified Communications products can help your business streamline operations, increase employee productivity, optimize business communications, and enhance customer care. Because protecting a unified communications-based network from attacks is crucial to maintaining business continuity and integrity, Cisco has built security features into its unified communications products, and augments them with the Cisco ASA 5500 Series Adaptive Security Appliances. The Cisco ASA 5500 Series is a family of multifunction security appliances for small businesses, branch offices, enterprises, and data center environments. These appliances deliver market-leading voice and video security services for unified communications, including robust firewall, full-featured IP Security (IPsec) and Secure Sockets Layer (SSL) VPN, intrusion prevention, and content security features. For unified communications deployments, these platforms can protect up to 30,000 phones and deliver application inspection for a broad range of unified communications protocols, including Skinny Client Control Protocol (SCCP), Session Initiation Protocol (SIP), H.323, Media Gateway Control Protocol (MGCP), Computer Telephony Interface Quick Buffer Encoding (CTIQBE), Real-Time Transport Protocol (RTP), and Real-Time Transport Control Protocol (RTCP). Access control: Dynamic and granular policy access control prevents unauthorized access to unified communications services. Threat prevention: Protecting the unified communications infrastructure from attempts to exploit the system. Network security policy enforcement: Effective unified communications policies for applications and users are created and administered. Voice encryption services: Cisco Transport Layer Security (TLS) Proxy can help customers maintain their security policies while encrypting signaling and media. Perimeter security services for unified communications: In addition to SSL and IPsec VPN services, phone proxy, mobility proxy, and presence federation, security services allow businesses to securely extend communication services to remote users, mobile solutions, and business-to-business collaboration. Access control is a basic security function that allows only authorized access to resources and services within a system. In a unified communications context, this control is often related to providing network layer access control to the Cisco Unified Communications Manager and other application servers as a first line of defense against attack. Restricting access to the Cisco Unified Communications Manager servers significantly reduces the risk of an attacker probing the system for vulnerabilities or exploiting access through unauthorized network channels. Cisco ASA 5500 Series Adaptive Security Appliances are voice- and video-aware, and they can inspect and apply policy to the protocols (SIP, SCCP, H.323, and MGCP) used in modern unified communications. Older network-access-control mechanisms such as access control lists (ACLs) cannot process these more complex protocols with the granularity and dynamism required by most organizations. Cisco ASA 5500 Series Adaptive Security Appliances can dynamically track the authorized connections that should be opened and close them as soon as the session has ended. This level of control, combined with other intelligent services such as voice protocol-aware Network Address Translation (NAT), distinguishes the Cisco ASA 5500 Series appliances from older platforms that are not suited to the requirements of modern unified communications protocols. The Cisco ASA 5500 Series protects Cisco Unified Communications applications from a range of common attacks that can threaten the integrity and availability of your system. These attacks include call eavesdropping, user impersonation, toll fraud, and denial of service (DoS). Many of these attacks (in particular, DoS) can be launched by sending malformed protocol packets to attack your unified communications call-control systems and applications. The Cisco ASA 5500 Series performs protocol conformance and compliance checking on traffic destined to critical unified communications servers. For example, the appliances can help ensure that media flowing through the appliance is truly voice media (RTP), or prevent attackers from sending malicious voice signaling that could crash your call-control systems. By helping to ensure that signaling and media comply with standard RFCs, the Cisco ASA 5500 Series provides an effective first line of defense for your critical systems. In addition to checking protocol conformance, the multifunction security services of the Cisco ASA 5500 Series appliances can be extended to provide intrusion prevention services. The Cisco ASA 5500 Series Advanced Inspection and Prevention Security Services Module (AIP SSM) applies hardware-based intrusion-prevention-system (IPS) features to inbound traffic to stop known attacks against unified communications call-control and application servers. A set of unified communications IPS signatures is available to protect against Cisco Unified Communications Manager and Cisco Unified Communications Manager Express Product Security Incident Response Team (PSIRT) vulnerabilities, giving your IT administrators immediate protection without needing to patch unified communications servers right away. The combination of protocol conformance and intrusion prevention provides a robust network layer defense against common unified communications threats. Your unified communications deployments are probably subject to the security policy requirements established by your organization's security department. With the sophisticated unified communications security features of the Cisco ASA 5500 Series, your organization can apply granular, application layer policies to the unified communications traffic to meet security compliance requirements. For example, your business can permit or deny calls from specific callers or domains, or can apply specific black lists or white lists. You can extend your network policies to endpoints and applications, for example, to allow only calls from phones registered to the call-control server or deny applications such as instant messaging over SIP. For compliance or security policy reasons, your organization might be required to provide confidentiality to voice and video traffic. End-to-end encryption often leaves network security appliances "blind" to media and signaling traffic, a situation that can compromise access control and threat prevention security functions. This scenario can result in a lack of interoperability between the firewall functions and the encrypted voice, leaving your business unable to satisfy both of your critical security requirements. The Cisco ASA 5500 Series encryption proxy solution offers exceptional support (TLS proxy) for Cisco Unified Communications Systems. This device is a trusted device within the Cisco Unified Communications Manager authentication domain: voice and video endpoints can securely authenticate and encrypt traffic. The Cisco ASA 5500 Series, as a proxy, can decrypt these connections, apply the required threat protection and access control, and help ensure confidentiality by reencrypting the traffic onto the Cisco Unified Communications Manager servers. This integration can give your organization the flexibility to deploy all of the required security countermeasures rather than settling for an inadequate subset. SSL and IPsec VPN: The Cisco ASA 5500 Series supports flexible, secure connectivity using SSL or IPsec VPN services that facilitate secure, high-speed voice and data communications among multiple office locations or remote users. These appliances support quality-of-service (QoS) features to facilitate reliable, business-quality delivery of latency-sensitive applications such as voice and video. You can apply the QoS policies on a per-user, per-group, per-tunnel, or per-flow basis so that the proper priority and bandwidth restrictions are applied to voice and video flows. In addition, preconnection posture assessment and security checks help ensure that VPN users do not inadvertently bring attacks to the network. The Cisco SSL and IPsec solutions are ideally suited to protecting soft-client unified communications traffic such as Cisco IP Communicator and Cisco Unified Mobile and Personal Communicators. You can also deploy the Cisco ASA phone proxy for voice and data VLAN segmentation for softphone applications. You can proxy Cisco IP Communicator traffic (both media and signaling) through the Cisco ASA appliance, thus traversing calls securely between voice and data VLANs. Presence federation: The Cisco ASA 5500 Series facilitates secure presence federation between Cisco Unified Presence and the Microsoft Office Communications Server (OCS) Presence solutions, allowing two organizations to collaborate more efficiently by sharing presence information about how to best reach and communicate with other users, and the common form of communication that is available. The Cisco ASA 5500 Series appliance is a mandatory component of presence federation solutions. Protection of call-control servers: By controlling access from clients to these servers, the Cisco ASA 5500 Series can prevent malicious or unauthorized network connections that could affect performance or availability. By statefully inspecting the connections to ascertain that they meet the access-control policy and that the connection conforms to expected behavior, the Cisco ASA platform provides a first line of defense for a secure unified communications deployment. 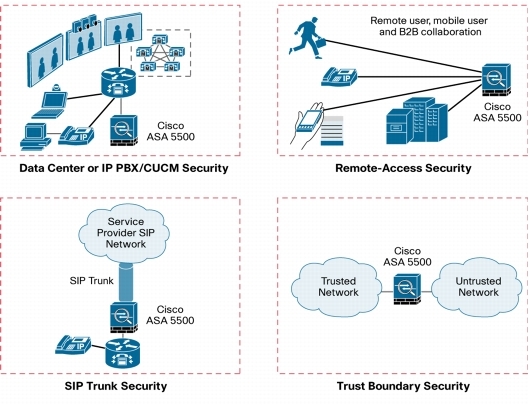 Remote-access security: The Cisco ASA 5500 Series delivers SSL and IPsec VPN, phone proxy, mobility proxy, and presence federation security services to secure teleworker phones, Cisco IP phones, and third-party phones such as Apple iPhones, mobile phones, and business-to-business federation deployments. SIP trunk security: Businesses are migrating to SIP trunk architectures to lower their communication costs. The robust SIP security capabilities of the Cisco ASA 5500 Series provide protection from any attacks through SIP trunks. Trusted and untrusted boundaries: You can position the Cisco ASA 5500 Series as a security device between a trusted and untrusted network to help ensure that vulnerabilities from the untrusted network do not affect the trusted network. You can use a Cisco ASA 5500 Series appliance to proxy traffic between voice and data VLANs, or to secure an internal network against external access in a DMZ architecture. Supported protocols include SIP, SCCP, H.323, MGCP, RTP and RTCP, TCP, CTIQBE, and Real Time Streaming Protocol (RTSP). This feature facilitates deep inspection services for SIP traffic for both User Datagram Protocol (UDP) and TCP-based SIP environments, providing granular control for protection against unified communications attacks. SIP application inspection and control delivers protocol conformance support for numerous SIP RFCs, including RFC 3261. It delivers SIP state awareness and tracking and the ability to enforce mandatory header fields and absence of forbidden header fields, thus protecting your business from attacks that use malformed packets. The feature facilitates Network Address Translation (NAT)- and Port Address Translation (PAT)-based address translation support for SIP-based IP phones and applications such as Microsoft Windows Messenger, while delivering advanced services such as call forwarding, call transfers, and more. This feature supports comprehensive threat defense features such as SIP state awareness and tracking; the ability to rate-limit SIP traffic to prevent DoS attacks, preventing SIP traffic from specific proxies from blocking SIP traffic from rogue proxy servers; and validation of RTP and RTCP for media. SIP application inspection and control allows your business to configure granular unified communications policies. These include permitting and denying callers and callees by configuring SIP Uniform Resource Identifier (URI) filters and inbound and outbound calls using white lists and black lists. In addition SIP application inspection and control enables permitting and denying use of applications such as instant messaging over SIP, or permitting and denying specific SIP methods (including user-defined methods). H.323 security services Versions 1-4 along with Direct Call Signaling (DCS) and Gatekeeper Router Control Signaling (GKRCS) provide flexible security integration in a variety of H.323-controlled voice-over-IP (VoIP) environments. These services support NAT and PAT, including advanced features such as fax over IP (FoIP) using the T.38 protocol, an ITU standard that defines how to transmit FoIP in real time. These services support threat prevention for H.323 traffic such as restricting call duration, preventing H.225 Registration, Admission, and Status (RAS) packets from arriving out of state, and validation of RTP and RTCP for media. The services can help your business configure granular policies for H.323 services such as filtering on calling and called phone numbers to prevent rogue callers, and restricting services by filtering on specific media types. Advanced SCCP inspection services support SCCP applications such as Cisco Unified IP Phones, Cisco Unified Personal Communicator, and Cisco IP Communicator to provide flexible security integration. These services offer comprehensive threat defense such as the ability to set the maximum SCCP message length to prevent buffer overflow attacks, the ability to tune timeouts for TCP SCCP connections and SCCP audio and video media connections, and validation of RTP and RTCP for media. The services can help your business configure granular policies for SCCP traffic such as enforcing only registered phone calls to send traffic through the Cisco ASA appliance and filtering on message IDs to allow or deny specific messages. Rich MGCP security services facilitate NAT- and PAT-based address-translation services for MGCP-based connections between media gateways and call agents or media gateway controllers. RTSP security services facilitate inspection of RTSP protocols used to control communications between the client and server for streaming applications such as Cisco IP/TV, Apple QuickTime, and RealNetworks RealPlayer. RTSP security services deliver NAT- and PAT-based address translation services for RTSP media streams to improve support in real-time networking environments. This feature facilitates inspection of H.323-, SIP-, and SCCP-based voice and multimedia streams that have been fragmented or segmented to prevent against these unique unified communications attacks. The advanced TCP security engine protects your network from several attacks, including SYN flood attacks using SYNC cookies, and protects your network endpoints against protocol fuzzing and retransmission-style time-to-live (TTL) evasion. This security engine delivers a smart TCP proxy feature that reassembles TCP packets to protect against segment attacks that use multiple TCP packets. The security engine offers TCP traffic normalization services for additional techniques to detect attacks, including advanced flag and option checking, TCP packet checksum verification, detection of data tampering in retransmitted packets, and more. These services provide the ability to inspect RTP and RTCP traffic on media connections opened by the unified communications inspection engines, such as SIP and SCCP connections. The services can help your business set security policies for RTP and RTCP traffic such as validating conformance to RFC 1889; cross-checking media values between signaling and RTP to validate payload type; and policing of version number, payload type integrity, sequence numbers, and the synchronization source (SSRC). The optional Cisco ASA 5500 Series AIP SSM applies intrusion prevention services to protect the unified communications infrastructure and call-control servers from IPS signature-based attacks. The module provides IPS services that are optimized for unified communications and support specific unified communications engines such as the H.323 and H.225 inspection engines; it also helps prevent OS attacks on call-control servers. Unique intrusion prevention capabilities such as anomaly detection, OS fingerprinting capabilities, and risk-rating features provide better context on threats to prevent false positives. These services can help your business implement a gateway-based content-inspection feature to inspect content of email and web traffic. This inspection helps ensure that the unified communications infrastructure is free from viruses, worms, spam, phishing, and malware attacks. TLS proxy addresses encrypted signaling and firewall integration concerns in situations in which encrypted signaling leaves unified communications firewalls unable to dynamically open ports or apply policies. As a trusted device within the Cisco Unified Communications Manager System, the Cisco ASA appliance can intercept the encrypted signaling, mutually authenticate with the endpoint, and decrypt the signaling. After the signaling is decrypted, the appliance retrieves all the necessary signaling information and applies all the inspection and policy enforcement actions. To maintain secure connectivity from end to end, the appliance then initiates a secondary TLS session back to Cisco Unified Communications Manager. The signaling and communications between endpoint and Cisco Unified Communications Manager remain functionally the same, and the firewall can deliver its unified communications security services. TLS proxy services support both SIP and SCCP endpoints for comprehensive integration with Cisco Unified IP Phones. Phone proxy delivers secure remote access without the need for a remote-access VPN device by terminating SCCP and SIP Cisco Unified IP Phone endpoints encrypted with TLS or SRTP. It supports Cisco Unified Communications Manager mixed and nonsecure modes. You can deploy phone proxy behind an existing firewall or as an integrated firewall or phone proxy appliance. Secure VLAN traversal delivers security for softphone applications by allowing all softphone traffic to be proxied through the Cisco ASA appliance. Cisco IP Personal Communicator is supported in authenticated mode. Mobile proxy protects Cisco Unified Mobility solutions, and replaces Cisco Unified Mobility Proxy. It incorporates a new inspection engine to validate mobility traffic, including protocol conformance and HTTP inspection for downloaded Cisco Unified Mobile Communicator software. This mandatory component of federation of Cisco Unified Presence with Microsoft Presence solutions secures presence information and applies security policies (white list, black list, and protocol conformance) between two organizations. Robust encrypted SSL and IPsec VPN services for both unified communications and data traffic offer preconnection posture assessment for endpoints and the ability to apply policies and inspection capabilities to VPN traffic to prevent remote users from introducing vulnerabilities to your network. Cisco AnyConnect client delivers optimization for voice with support of Datagram Transport Layer Security (DTLS). It secures third-party endpoints such as Apple iPhones. Option 1: Unified communications proxy licenses: You can order Cisco Unified Communications proxy software licenses separately (ASA-UC-X) so your business can deliver phone proxy, mobility proxy, presence federation, and TLS proxy features. You can combine these features for up to the maximum number of sessions listed in Table 2. Option 2: Cisco ASA 5500 Unified Communications Edition bundles: Cisco ASA 5500 Unified Communications Edition bundles provide appliances bundled with unified communications proxy licenses to offer your business a single hardware and software product ID to deliver phone proxy, mobility proxy, presence federation, and TLS proxy features along with the base firewall and VPN functions. Option 3: Cisco Secure Unified Communications bundles: If your organization is investing in a Cisco Unified Communications Solution, you can order a bundle that includes Cisco Unified Communications Manager and a Cisco ASA 5500 Series Adaptive Security Appliance. These bundles, when configured using the Dynamic Configurator tool or the Cisco Online Ordering Tool, provide Cisco ASA 5500 Series model recommendations for every Cisco Unified Communications Manager server. Download the Cisco ASA 5500 Series Unified Communications Deployments (PDF).